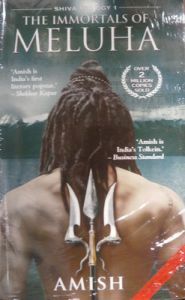 The Immortals of Meluha (Shiva Trilogy) is the first chapter of the Shiva Trilogy that showcases the making of Lord Shiva through a fictional medium. The narrative unfolds in the immemorial land of Meluha, where reigns the Suryavanshi clan, a highly civilized society of rules, regulations and guidelines. Abiding by their just means of lifestyle, there is persistent fear of terrorist attacks from the Chandravanshis, a clan-less civilization allied with the heinous Nagas. Together, they conspire to steal the secret formula of the Suryavanshi holy drink, Somrasa. With this paranoia, there are whispers of a prophecy pertaining to a blue-throated man from the lands of Sapt-Sindhu who would rescue the Suryavanshis from their turmoil. Enter Shiva, a tribal patriarch from the mountains of Kailasa, who travels from his home territory to Meluha in search of safety and shelter. The mystery of his throat turning blue after consuming Somrasa, begs the Meluhan people to ask a question of cosmic proportions, Is he the prophesied one? The story redefines the nomenclatures of iniquity and integrity precedented by legendary characters, folktales and Puranas mingling cohesively into an integrated pattern. The story written by critically acclaimed author, Amish Tripathi truly captures the spirit of these archaic ages in their true color. The books is available in paperback . Key Features: Dharma Productions has bought the movie rights for this acclaimed book. The book features on the bestseller list of several newspapers and magazines , including The Times of India, The Statesman, Rolling Stone India, The Economic Times, among others. Born on 18 October, 1974, Amish started life as a finance veteran and eventually transformed into a breakthrough Indian author. He made his way on to the bookshelves for the very first time in the February of 2010. He abandoned his 14 year career in finance when the first book of the Shiva Trilogy, the Immortals of Meluha was released and followed it up with the Secret of the Nagas and the Oath of the Vayuputras.